Seven years into its fourth decade, Le Cirque has seen the American dining landscape change, shake, rock, roll, slide, soar, and come back to the need for a sense of refinement that the restaurant has always represented under the Maccioni family (below), which includes paterfamilias Sirio, his wife Egi, and their sons Mario (far left, who runs the Maccioni restaurants in Las Vegas), Marco, and Mauro, whom I have literally watched grow up and become various reflections of their parents while having each his own style and distinct degree of savoir-faire. Le Cirque–the circus–is still a daily draw for international celebrities, winemakers, Hollywood stars, even royalty, as it has been from the start. The list of chefs Le Cirque has employed to mold and maintain the Maccioni vision of impeccable but creative taste has included Daniel Boulud, David Bouley, Terrance Brennan, Alain Sailhac, Rick Moonen, Jacques Torres, Sottha Khun, Sylvain Portay, Christophe Bellanca, Michael Lomonaco, Alain Allegretti, Pierre Schaedelin, Bill Telepan, Alex Stratta and Geoffrey Zakarian to name a few–many of them shown in the photo below. Indeed, such a list suggests that as a graduate school Le Cirque has exerted the most influence on fine dining of any restaurant in America. The closing of similar haute cuisine French restaurants in NYC alone–for many diverse reasons–like Lutèce, La Côte Basque, and La Caravelle only hints at Le Cirque’s ability to evolve rather than remain staid over three locations, from East 65th Street (Restaurant Daniel is now there) to The Palace Hotel (presently Gilt) and now to the plaza of the Bloomberg Building, this last a winsome, arched dining room with high ceilings and windows and a popular bar and lounge set off to the side. Australian-born chef Craig Hopson (second from the left in the photo) has very much come into his own over the last two years while never betraying the Le Cirque style, which is basically French in the classic manner, with new American and global accents, and a good deal more Italian cucina moderna on the menus, owing to the Maccionis’ proud Tuscan heritage. Hopson’s résumé is thick with illustrious names–stints at the Hôtel d’Angleterre in Geneva, Troisgros in Roanne, Guy Savoy and Lucas Carton in Paris, Circa in Brisbane, and, more recently, as chef de cuisine at Picholine and executive chef at One If by Land, Two If by Sea in NYC. On my recent visit I leapt at the chance to have bay scallops–a very seasonal item–here done as crudi with a Granny Smith gelée and mustard seeds. I always think consommé, once a staple in fine dining restaurants, a good way to judge a kitchen’s strengths, and Hopson’s was textbook perfect, a beautiful mahogany color, clear as glass, richly flavorful with mushrooms and little ravioli stuffed with mascarpone cheese. A foie gras torchon with a salad of winter greens and citrus was creamy and finely textured, while foie gras ravioli were plump and delicious. Risotto with black winter truffles–you can see the vivid Italian cast throughout–was a triumph of impeccably cooked rice with the unique flavor of the truffles shaved over it. Desserts are not quite so fanciful as they were in the days when Jacques Torres was chef here, but patîssier Pierre Poulin has in fact brought back the famous chocolate kitchen stove (right) a toy-like confection that also happens to taste wonderful. Le Cirque’s winelist has been winnowed some but it is very well selected, with at least 20 percent of the bottles under $50, some as low as $28, which is very much part of the Maccionis’ plan to make Le Cirque far more approachable than people think it might be. Check out the wines, which are stored in a spectacular glass column near the entrance. By the way, there is now also a jazz quartet in the lounge, starring Marco Maccioni’s beautiful wife, Sabrina Wender-Maccioni (left). If you have never been to Le Cirque or not in quite a while, you will find all of its best virtues intact while Hopson’s wonderful cuisine adds measurably to the idea that this is a timeless place that has had enormous influence on NYC fine dining. Le Cirque is open for lunch Mon.- Fri., for dinner Mon.-Sat. Dinner at Le Cirque is fixed priced at $92 for three courses, or $125 for a tasting menu (with wines, add $75); at lunch the Café menu is $28. John, do you have anything more to say on Tre, as someone who was turned on to both your reviews and KNPR (as well as the restaurant itself) shortly after moving to Las Vegas? After having any number of dinners there that rivaled what I found on the strip back then, simply put, I began to doubt my decision to buy a house in Vegas after it closed. Looking back on it, was it true as you seemed to indicate back then that we, we simple few, who actually lived and worked in Vegas couldn’t appreciate a restaurant like that off Strip? ELV responds: I was a big fan of Tre (for you newcomers, Tre (tray) was the Maccioni’s attempt to bring quality dining to the neighborhoods back in the early aughts). I always thought they gave up on it too early (of course, I had no idea what the money/financing situation was), but for years held it up as Exhibit A as to why Vegas locals were/are mired in the cult of franchised food mediocrity. I said it then and I’ll say it now: Las Vegas is a community full of people driving $50,000 cars who don’t want to spend more than $50 on dinner. Nothing that’s happened in the last 8 years has changed my opinion. The few quality restaurants that survive (Marche, Nora’s, Rosemary’s, Todd’s) do so by keeping prices way down, and their menus very simple and predictable, because they know they are one, tiny price bump (or menu change) away from losing their customers to P.F. Chang’s or Fleming’s (who benefit from large, corporate ownership and the reduced costs/advertising that brings). 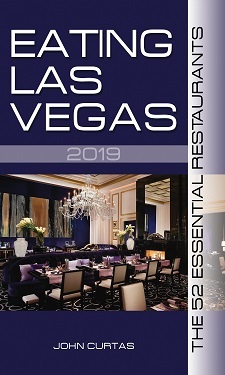 Bottom line: I think there are less than 5,000 avid foodies in Vegas (with a little disposable income and imagination) who will venture to the Strip for the good stuff (and who will/would support a good, local full-service restaurant). That’s enough to keep the few place we have afloat, but most locals would rather sit in a cheesy bar or at a video poker machine, or let some advertising campaign tell them how and what to eat. I for one didn’t find Tre to be anywhere near as expensive a restaurant as some of the places I went to on the Strip. Wasn’t one of your contemporary comments (~2004) when Tre closed was that the few Vegas locals willing to shell out for quality food were much more willing to pay a Strip premium than to risk slumming it at a neighborhood restaurant, even when the neighborhood place was obviously of similar quality? Regardless of the lack of adventure now @ the usual local suspects, are locals today still predisposed to discount neighborhood restaurants in favor of Strip joints? I’m also wondering if the implosion of the local economy has caused the locals who could spend Strip prices to reconsider and visit Todd’s/Rosemary’s/Table 34 more often. Why take a risk on eating off the strip locally when you know you will get excellent quality and service in a 20 minute drive to the strip. I’d drive an hour for a good hamburger, why complain about a 20 minute drive if I’m going to drop a few hundred on dinner. Only exceptions to this are a few restaurants in chinatown and I do like Nora’s wine bar and Marche Baccus too.